Help Anna run her pedicure salon in this fun makeover game! Anna's Pedicure is not only one of the best makeover games but it also features Anna. Follow the in-game instructions to give Anna's customer the best pedicure ever. Removing the old nail polish, clipping and trimming the nails then applying hand lotion are all part of this exciting and educational game. With this preparation in place, you can now create your own nail design and choose from a wide range of different colors, patterns and even apply beautiful accessories like diamonds to the nails. Create as many designs as you want and show your friends your wonderful sense of style! 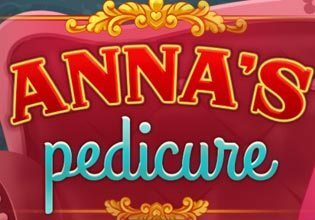 Play Anna's Pedicure now for free and experience one of the best makeover games!